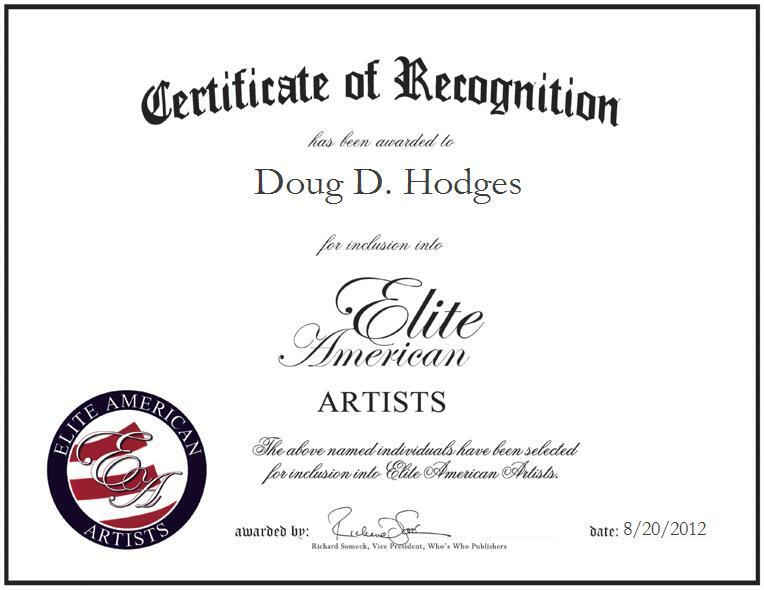 BROWNSVILLE, TX, August 20, 2012, Doug D. Hodges, Freelance Photographer and Writer, has been recognized by Elite American Artists for dedication, achievements, and leadership in photography and writing. With nearly three decades of professional experience under his belt, Mr. Hodges shines as a luminary in his field. The renowned novelist and writer of short stories, poetry and songs, also teaches, takes original, inspired and unique photographs, and mats, frames and restores photos. In 1998, Mr. Hodges received a message that he should quit his job, trust in the spirits and travel, which he did, for some 70,000 miles. This became the catalyst for his books. To date, he has published seven books entitled ‘The Voice of Coyote’ (2003), The Way it Was: Further Adventures of Coyote and Raven (June 2006), Beloved Mystery: Poems & Songs (September 2006) and Flock of Dogs (October 2007), which are cherished works of poetry, Realms: The Continuing Tales of Raven, Coyote & The Rest (April 2009), New Vistas: More Tales (September 2010), and Passages: Stories & a Baker’s Dozen Poems (February 2012). Three are collections of short stories and two books are poetry collections. The last four books are illustrated with his own photographs. Mr. Hodges worked for 24 years in the newspaper industry and has a lifetime of experience in communications. Mr. Hodges has had an ever-changing career called life. The highlight for him was the most transitory moment, when he chose to listen to Spirit Raven. This led him to ponder the Spirit Raven’s offer of letting go, which in turn, led Mr. Hodges to quit his job, quit working for other people, sell the bulk of his possessions, and go on the road. For him to give up control of a well-controlled life was the first step on the way to flowing into harmony with the world about him. If Mr. Hodges is perceived a success, it is probably because he is happy. He feels he has been blessed with gifts and a means to share those gifts. To him, that sharing is what life is all about. His joy lies in the very sharing of his gifts and interchange with the gifts of others, his gifts and theirs, his stories and theirs (and we all have gifts and stories). In this interaction, his life is enriched. If he is set apart from other writers and photographers, it is in his feeling of not being tied down. Money, time, deadlines are not issues. Mr. Hodges has received some awards in his time, for a variety of accomplishments. Those that mean the most to him are those given by people he has known, worked with, helped out. Institutional awards are nice, but to him, they are like money; they don’t live within the soul. When offering advice to others, Mr. Hodges says to allow God, the world, and fate, or whatever one would call destiny to guide them, and do not fight your gut. Remember that nothing is ever cast in stone, and that life is an ever-changing canvas. In conclusion, Mr. Hodges hopes to be able to keep on journeying, listening, sharing what he has heard, seen and learned, and the gifts that he has been given with others. He believes we are all a splash in the great pond and our ripples go out and intersect and interact with those of everyone else, creating an incredible tapestry (or web), which is this mystery we call life.